Consider Invisalign to get the beautiful straight teeth you’ve always wanted – without braces. A complimentary consultation with Dr. Papandreas can determine if this method of orthodontic treatment is right for you. If you or your child needs orthodontic correction, your treatment options can be overwhelming. There are so many alternatives today, including colored brackets, braces worn behind the teeth, and traditional braces. Invisalign clear aligners is one of the most popular forms of treatment today, used by patients of all ages and celebrities. Before you make your choice about what is the best form of orthodontic treatment for you, you need to have an understanding about Invisalign and what it involves. Invisalign is a form of treatment that involves the use of clear aligners. 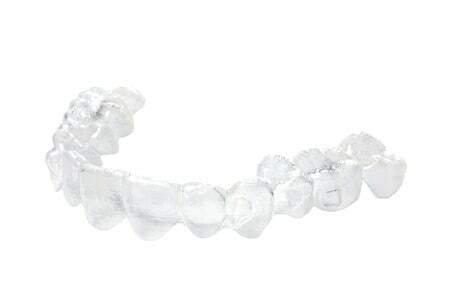 These aligners are removable and they are made from a smooth plastic that is medical-grade. They can provide correction for a host of orthodontic concerns, including overbites, underbites, problems with crowding, and issues with too much space. Aligners are customized for every patient through the use of medical imaging. If you choose Invisalign treatment, your aligners are specifically made to fit your mouth. They are exchanged for a new set on two week intervals. With each set, your teeth are gently being shifted into the proper position. You do not have to deal with metal in your mouth that may cause irritation. You can remove your aligners as necessary, such as when you are cleaning your teeth, eating something that could stain the plastic, or if you have a special function. For anyone involved in contact sports, it is advised to remove the aligners while playing. Aligners need to be worn at least 22 hours on a daily basis to be most effective. Most people choose Invisalign because treatment is not noticeable. For those who are self-conscious, it’s preferable to have an orthodontic correction that cannot be seen unless someone is really looking for it. In addition, Invisalign takes a similar amount of time as other methods. It often compares in price as well. For anyone who is a suitable candidate for Invisalign treatment, it is the preferred way to go. When you choose to correct orthodontic problems with Invisalign, you’ll benefit from more than straight teeth. You can stave off problems with TMJ disorders and sleep apnea when your teeth are in proper alignment. You’ll also find that is easier to keep your teeth healthy when you can clean them more easily. Your teeth will look good and you can enjoy them as you get older. To find out more about Invisalign and its advantages for you, contact Papandreas Orthodontics today. Call 330-558-9092 or contact us here to schedule your initial visit to have your first consultation. The orthodontist will provide you with a thorough examination and evaluate your teeth. You can discuss all of your treatment options, including Invisalign. This is your opportunity to do something about your teeth. If you have been hiding your smile, you owe it to yourself to discover how Invisalign can make a difference for you.